Panthère Sportive, based in Bangangté in the Western parts of Cameroon, won the “Coupe Nationale” in 2009 and surprisingly became number four in the MTN Elite One 2009-2010. The club has made major progress during the last couple of years and is currently number five in the MTN Elite One 2010-2011. Alain Tekeu Tchoumte is a highly regarded goalkeeper and many experts think he was the best goalkeeper in Cameroon during the season 2009-2010. Tchoumte is not the tallest of goalkeepers and somewhat eccentric but a truly amazing shotstopper at this level. The commanding Ulrich Chouba, central defender Serge Brown Ngayaou (born 06.10.1980) and full-back Gerard Pahane (born 17.10.1981) are arguably the most important defenders at the club. Chouba was part of the Cameroon U-20 national football team in 2009 and is probably the most interesting player of the three from a scout’s point of view. The midfield is bossed by the energetic Franck Kom (born 18.09.1991), presented in my post from 08.03.2011, and Isaac Tatchoum (born 29.08.1982), sometimes the captain of the team. Both players are primarily defensive midfielders. Eugene Didier Talla Nembot (born 18.03.1986) is also a brilliant and versatile midfielder with more attacking qualities, some of which can be viewed by following this link: http://www.youtube.com/watch?v=PTnBsz9kf6E. Emma Mimba provides cover at central midfield. Explosive left-winger Ngampiep Vigny Kologni (born 27.11.1983) was simply brilliant last season but has obviously been out with an injury as he only recently featured in the league again. Alain Rodrigue Djomou (born 22.10.1985) is also a fine winger. Burly striker Rostand Kako (born 22.03.1990), presented in my post from 25.11.2010, is still the most dangerous attacker at the club despite having only two goals to his name so far this season. The highest scorer at the club is currently Ngueyou Miguel Kamwa (born 01.11.1988), formerly of Union Douala and Infinitif d’Ebolowa. Justin Junior Mengolo is one of the hottest prospects at the club. Mengolo, a youthful attacker, was signed from lowly AS Sanaga before the season. He was recently added to the squad of the Cameroon U-23 national football team and was also part of Cameroon U-20 in February and March 2011. He was also a surprise inclusion for Cameroon U-23 in July 2010, while still featuring for AS Sanaga. According to http://www.mybestplay.com, Mengolo is born 24.06.1993. There are several rather shocking differences between the date of births I have registered, all of which are taken from an official source (the Fédération Camerounaise de Football), and the date of births found in the document. Ngayaou’s date of birth is given to 10.03.1989, Pahane’s date of birth is given to 17.10.1988, Talla Nembot’s date of birth is given to 08.05.1989, Kologni’s date of birth is given to 27.11.1991 and Tatchoum’s date of birth is given to 29.08.1991, in other words differences of nine, seven, three and nine years, respectively. Renaissance FC, from the small town of Ngoumou in central Cameroon, is basically a candidate for relegation and a rather uncelebrated club in the country, but still one of the most interesting teams from a talent scout’s point of view. The club has several talented, young players with a bright future in front of them. Goalkeeper Eric Ngana has been training with the Cameroon U-20 national football team earlier this season. Ngana has been sharing the number one shirt with Ferdinand Ngarwa (born 27.06.1991), who has been involved with both Cameroon B and Cameroon U-20, and the more experienced Aimé William Nsangou (born 02.09.1985). The strongful Alfred Dassi (born 12.12.1990), Marcellin Bisso and Cameroon U-23 defender Ibrahim Walidjo are all important for the defensive line of Renaissance FC. Two former players of Canon Yaoundé, René Guy Endougou and Emmanuel Bebga have re-launched their careers at Renaissance FC. 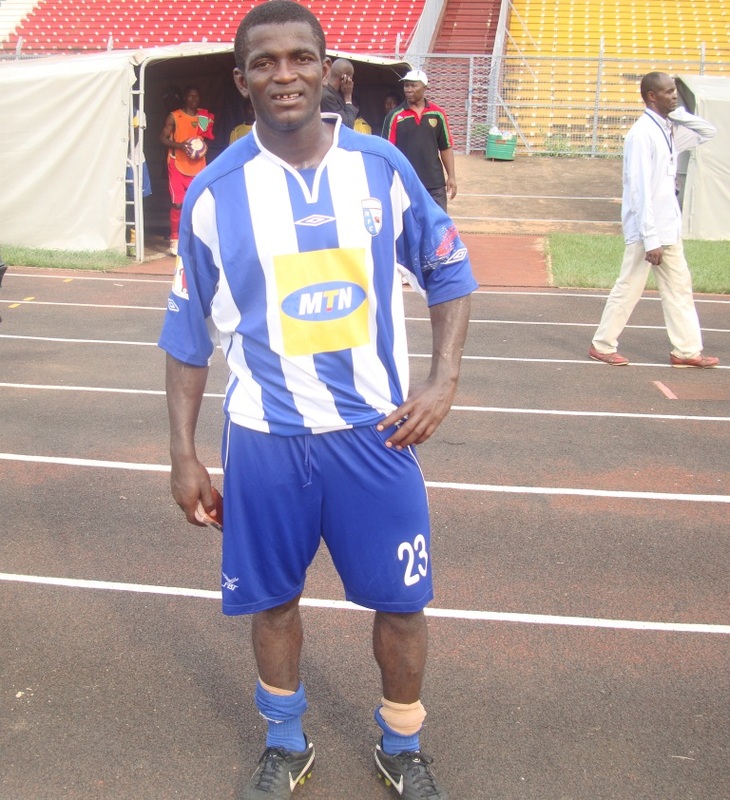 Midfielder Luc Ahanda Ayissi is the experienced captain of the team and Steve Belinga has been almost ever present in the centre of the park. Midfielder Patrick Anaba Metogo (born in 1994), formerly of ISMACO d’Ebolowa, was part of the Cameroon U-17 national football team in 2010 and is now forcing his way into the Cameroon U-20 national football team. Midfielders Thomas Junior Libiih and Christian Toko Edimo, most likely born in 1994 and 1993 respectively, are currently part of the Cameroon U-20 national football team. 1994-born Marius Obekop Bedzigui was presented in my post from 14.01.2011 and is a wonderful attacker / attacking midfielder with an excellent left foot. Camille Kamdem is a new signing from Ouaragan FC de Yaoundé and this young player, apparently born in 1992, could very well become a star. Kamdem was recently named in the squad of the Cameroon U-23 national football team and is a lively, attacking midfielder, apparently almost 2 meters tall. Joshua Mbuluba Ndoh (born 15.01.1992) is a recent signing from Tiko United FC and a former member of Cameroon U-20 and Cameroon U-17, participating for Cameroon U-17 in the African U-17 Championship in 2009. The third new interesting signing is attacker Franklin Nougoum Ngassam, also a former member of Cameroon U-20. However; Renaissance FC will be missing the services of attacking midfielder Yazid Atouba Emane (born 02.01.1993) and Alain Ndjan, who both decided to join Canon Yaoundé during the transfer window. Junior Gouiffe is arguably the top striker at the club. Gouiffe played for Western Province United FC, a second level club in South Africa, in 2007-2008. However, the big star at Renaissance FC is captain and top scorer Alix Bertin Ondobo Ebanga (born 26.01.1990), an attacking midfielder or second striker, who apparently had a stint in Morocco before joining Renaissance FC. Ondobo Ebanga has scored 5 league goals so far this season. The picture is of Ondobo Ebanga and is taken from Le Chabba.